A targeted anti-aging gel-cream for complete rejuvenation of the décolleté. This creamy gel delivers the same smoothing, redensifying and toning results as traditional cosmetic therapies, but in the comfort of one’s own home thanks to a cocktail of high-tech ingredients. 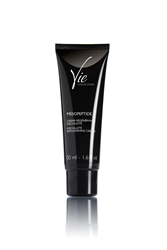 Vie Collection reaffirms its cosmeceutical expertise with MÉSOPEPTIDE DÉCOLLETÉ REPLENISHING CREAM, a breakthrough anti-aging solution for the décolleté inspired by mesotherapy and laser treatments. This creamy gel delivers the same smoothing, redensifying and toning results as traditional cosmetic therapies, but in the comfort of one’s own home thanks to a cocktail of high-tech ingredients. Bioassimilable spherical particles deliver synthetic peptides directly to the fibroblasts, where they trigger a massive production of collagen to kick start skin redensification. A duo of hyaluronic acids penetrates to the dermis where it swells on contact with water, adding volume to hollow areas, filling deep wrinkles and smoothing the skin. Meanwhile, an ultra-stable derivative of vitamin C protects the skin from free-radicals and blocks melanin synthesis for comprehensive skin-lightening effects. MÉSOPEPTIDE DÉCOLLETÉ REPLENISHING CREAM has a tangy citrus scent with feminine jasmine notes. Its hybrid formulation combines the comfort of a cream with the tensing power of a gel and melts into the skin, leaving an ultra-soft finish. Light-reflecting pearlescent agents remain on the skin’s surface, instantly enhancing the skin’s appearance. Day after day, the décolleté is moisturized, wrinkles and crepey skin are smoothed and a more consistent complexion is revealed. Directions for use: Apply morning and/or evening to entire neck and décolleté. Tested under dermatological control. Peptides - synthetic peptides that “trick” the fibroblasts into producing collagen. Bonded to bio-assimilable spherical particles that protect the peptides from degradation by enzymes present in the skin. Encapsulated High Molecular Weight Hyaluronic Acid - hyaluronic acid confined to spherulites that easily penetrate the skin and gradually open for controlled release. Expands on contact with water in the dermis to add volume to hollow areas and fill deep wrinkles. Low Molecular Weight Hyaluronic Acid - helps maintain skin hydration by creating a water reserve in the dermis. Limits transepidermal water loss. Vitamin C - ultra-stable derivative known for its anti-dark spot and anti-free radical action. Protects the skin from external stress, thereby reducing existing pigmentation spots and preventing the appearance of new spots. **Satisfaction test conducted on 24 women after twice-daily application for 28 days. As a cosmeceutical expert in the spa industry, Vie Collection is a high performance, high-end skin care line focused on bridging the gap between traditional cosmetics and esthetic medicine. We are one of few spa brands with our own laboratory which allows us to always be on the cutting-edge of scientific progress in cosmetics. We offer in-spa solutions for a spa-savvy clientele that seek medical results but prefer the use of topical products. Vie Collection has targeted, noninvasive and clinically proven alternatives and complements to the top five cosmetic medicine procedures available today. With the partnership of a prestigious French esthetic doctor, Vie Collection brings expertise, authenticity and real results in the form of expert formulations and treatments, from the finest ingredients.